Help spare your drains and sewer or septic system with grease traps. If grease and oils continue to go down the drain, they often clog up pipes because they thicken as they cool. This can cause smelly backups into your home or business. The result is that your system will require much more frequent pumping and maintenance, which can be a waste of time and money when there’s a better solution. 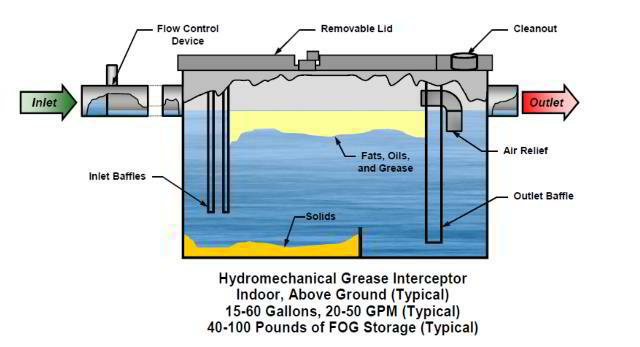 Grease traps catch, separate and hold the stuff you don’t want to go through your pipes.If your business deals with a lot of greasy substances like food or oils, it may be worth considering an investment in a grease trap. Contact professionals at Septic Zone in Columbus today, and we can come inspect your business and discuss with you what your best options are depending on your situation. If you already have a grease trap installed, it’s important to make sure it continues to function well and do its job properly. If you are having trouble with the grease trap, or it has a smell that’s backing up into your kitchen or otherwise, contact our Youngstown septic service company right away, and our technicians will see what the problem is to make necessary grease trap repairs. Our technicians pump grease traps and can even set up a time frame for us to come by and take care of your business. We’ve been providing sewer-septic services in the state of Ohio for years. We’re available 24/7 in case of any emergency and can perform camera inspections if you experience any problems with drain lines clogging. We understand that things happen unexpectedly, and we’ll be there to help as soon as possible so your business isn’t interrupted.